In September, I had the pleasure to welcome UFI’s Executive Committee to my home town, St. Petersburg. There, we discussed all the major activities UFI is pursuing, in the area of research, on education programmes and events, on industry advocacy efforts like Global Exhibition Day, and many others. I am proud of the many achievements and activities I have reported to you over recent months. And I want to share one more success with you today: The EEIA, UFI’s collaboration with EMECA, has won a tender to run an EU project that will directly benefit ten trade shows with a total of more than one million euros. This is the first time that we have achieved direct EU funding for our industry, so I want to congratulate Barbara Weizsäcker and everyone involved! One of the main points of our St. Petersburg meeting was the update from our Managing Director/CEO Kai Hattendorf on our upcoming Global Congress in Shanghai. Already now, delegates from more than 50 countries have signed up. Our teams in Paris and Hong Kong are working at full speed, together with our hosts in Shanghai, led by former UFI President Xianjin Chen. I am fascinated by the great content we are preparing! 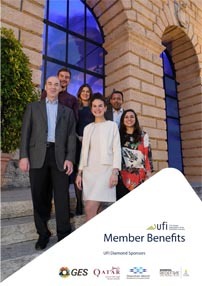 I am especially looking forward to two features of this year’s Congress: First, there is the “Next Generation Leaders“ session, where UFI’s five grant-winners will shine light on how our industry will change in the years ahead. Normally, we older members of the industry do our best to teach the younger ones. But here we’ll have the chance to listen and learn. My second recommendation for you is the session on “What visitors want – and hate“. In the past months, UFI and our official research partner Explori have been shifting through global data to filter out what makes – and keeps – visitors happy, and just as importantly, how organisers can retain and bring back unhappy visitors to their shows. I believe that this will be an exciting addition to UFI’s growing research portfolio! Personally, I was in Shanghai at the beginning of this year, and I have been amazed by the changes the city has gone through and by its new venues. So, in my opinion, this city currently is the place where every leader of our industry must have spant at least a few days, to understand some future developments of our industry. So if you haven’t signed up yet, because you’ve been as busy as most of us – make sure not to wait too long. It only takes five minutes, and you can have your space secured. I look forward to seeing you all in a few weeks in Shanghai!